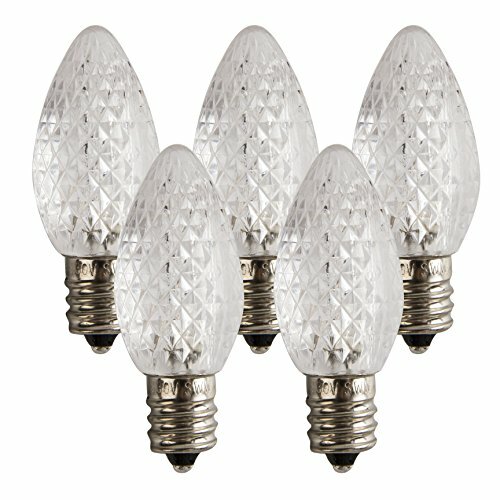 These C7 LED Replacement bulbs give your holiday lighting an instant glow by creating your childhood dream.10 Times more energy efficient than incandescent. Quantities of 25 making them an economical choice. CSA-US listed for indoor and outdoor use. Use C7 Warm White, LED Light bulbs for Christmas and make a dazzling display this year,120Vac,60 Hz E12 Base Type for C7. INDOOR&OUTDOORUSE:ULListed,PerfectforChristmasTrees,Wreaths,Wrapping,trees,Patios,Pergolas,Bushes,Hedges,Fences,Pillars,Weddings,Holidays,Prom,Dance,Functions,Restaurants,Bars or Wherever,Decoration,Lighting is Wanted!0.96 Watts per bulb. Energy savings and eco friendly - Reduce power consumption by more than 90% compared to incandescent bulbs .120V Faceted LED C7 Replacement Night Light Bulbs. Bulb shell made of weather resistant, break resistant durable plastic.Dimmable ,Fit into E12 light sockets. Bulb housing made by waterproof , break resistant durable plastic, faceted strawberry candle appearance.Multicolor Faceted C7 LED night lights come with a faceted finish that not only adds a decorative element in its own right ,but also helps cast a light that is bright and inviting. Dimmable - Can be used for light shows,25 pack per bags. 3 LED's in every bulb for a brighter look. Fits into C7 or E12 light sockets and they are a full colors combination of the many available options that customers have when they shop the selection at Environmental Garden. If you have any questions about this product by Environmental Garden, contact us by completing and submitting the form below. If you are looking for a specif part number, please include it with your message. Vickerman Purple Commercial Sized Shatterproof Christmas Ball Finial Ornament, 55"
Vickerman Gold Matte with White Glitter Chevron Commercial Size Christmas Ball Ornament, 8"
Vickerman Teal Green Matte with Sea Blue Glitter Chevron Commercial Size Christmas Ball Ornament, 8"
Vickerman Diva Safari Zebra Print/Stripes Black and White Commercial Size Christmas Finial Ornament, 13"
Vickerman Candy Black with White Glitter Polka Dots Commercial Size Christmas Ball Ornament, 8"
Vickerman Candy Gold with White Glitter Polka Dots Commercial Size Christmas Ball Ornament, 8"
Vickerman Shiny White UV Resistant Commercial Drilled Shatterproof Christmas Ball Ornament, 10"